Another virtually sleepless night for the pair of us, although there was some snoring coming from the other bed for at least part of the night. We just lay awake discussing why we couldn’t sleep and counting down the hours to breakfast. The longer we lay awake the more desperate we got knowing we needed plenty of energy for the day ahead. It was a relief when it was time to get up and start our routines, me at breakneck speed and Nige faffing about re-packing his suitcase for the fourth time. As we got up we were somewhat shocked to see that the pretty babbling brook that had passed so quaintly past our window the previous night had turned into a raging river carrying some very large branches and other debris down to the lake. It really was quite dramatic but neither of us, at that stage put 2 and 2 together and thought what it may have meant for the day ahead. Breakfast was huge and served with great enthusiasm by the temporary landlady. She explained that she would love to buy the pub and turn it into a place solely for Coast to Coast walkers. She saw that there was an opportunity there with virtually a captive market but as it stood it was doing nothing. We were the only walkers staying that night and that told a story. 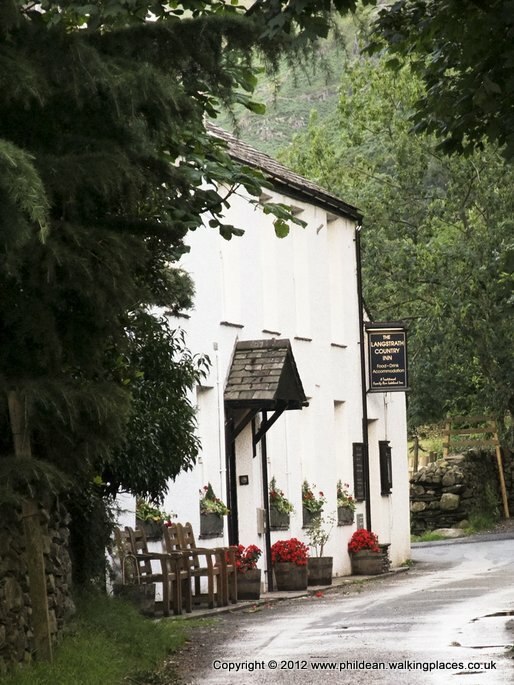 We left our cases at the bottom of the stairs for Sherpa Van to carry to Stonethwaite and strolled over to The Shepherd’s Arms to collect our packed lunch. The place seemed deserted and we had to wander into the kitchen to get someones attention. They hadn’t started making up the packs so we stood around for 20 minutes while they put them together. To be fair the bags felt substantial and we paid up and started off up the road. 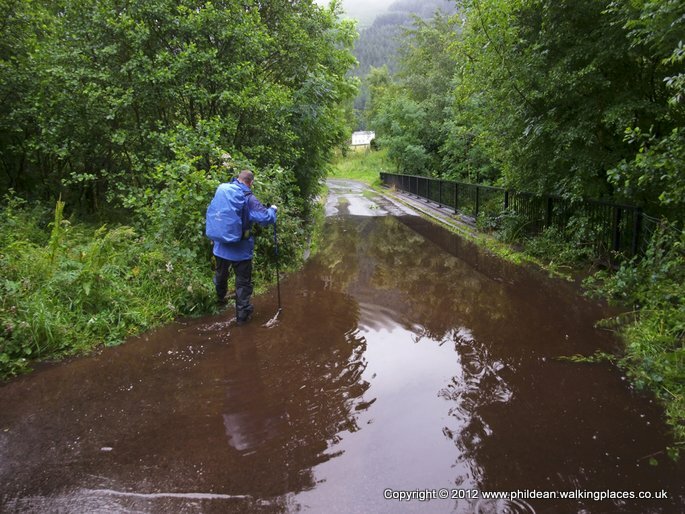 Nige spotted a red squirrel squatting in the trees at the side of the footpath but what grabbed our attention more was a huge puddle / flood in the road just as we approached the lake which gave us a clue as to what was to come. 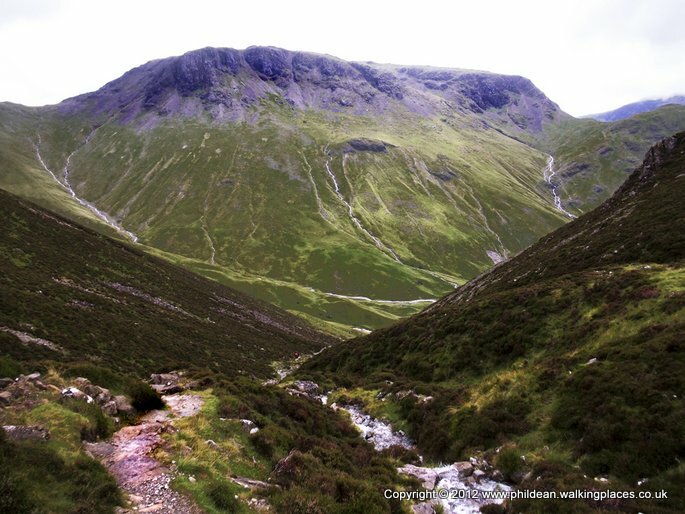 There was no choice but to wade ankle deep at this stage and I saw Niges shoulders visibly slump as he felt that first trickle of cold water seep into his boots. 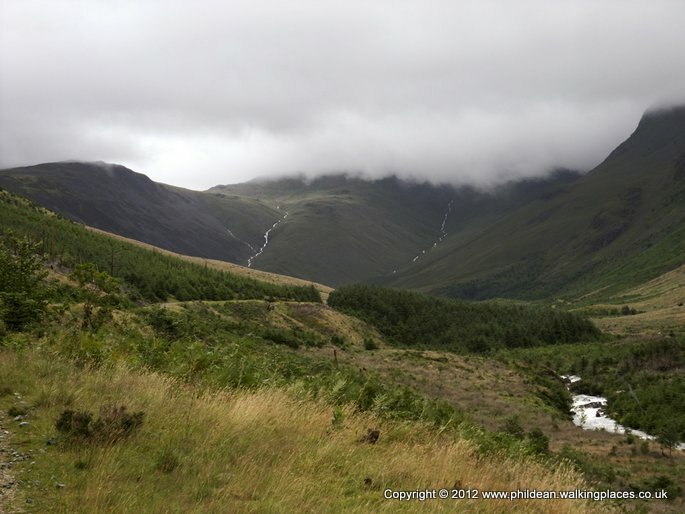 We laughed that this would be something to tell the folks back home and carried gamely on around the next bend to where Ennerdale Water came into view. The scene was fairly dramatic with water everywhere we looked. It was pouring through overflow sluice grids, gushing off the surrounding hills into the lake and starting to fall out of the sky. We reminded ourselves that only the previous weekend a hose pipe ban had been imposed in the north of England! 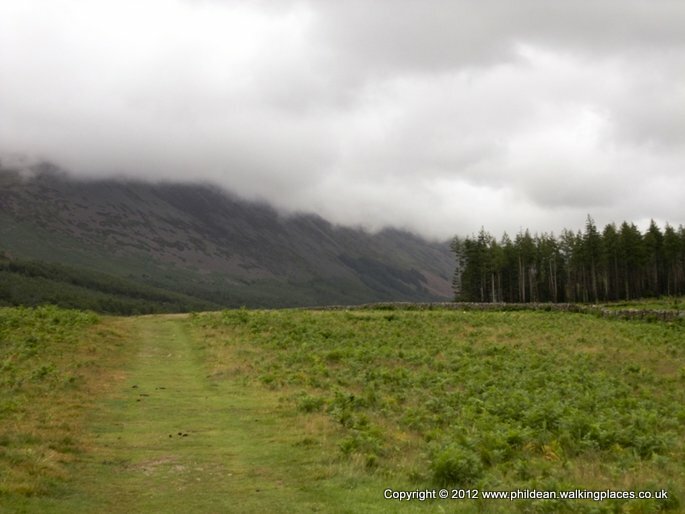 It was at this point that I really should have double checked the small print in the guide book which strongly hinted that in bad weather it would be sensible to choose the path that wound around the northern shore of Ennerdale. However, doing this would have meant missing the best views of the lake and features along the shore such as Robin Hoods Chair so, after a few more photos and video footage of us joking about the weather and how it must surely clear up soon, we headed off down the southern path which had turned into something of a fast flowing stream. 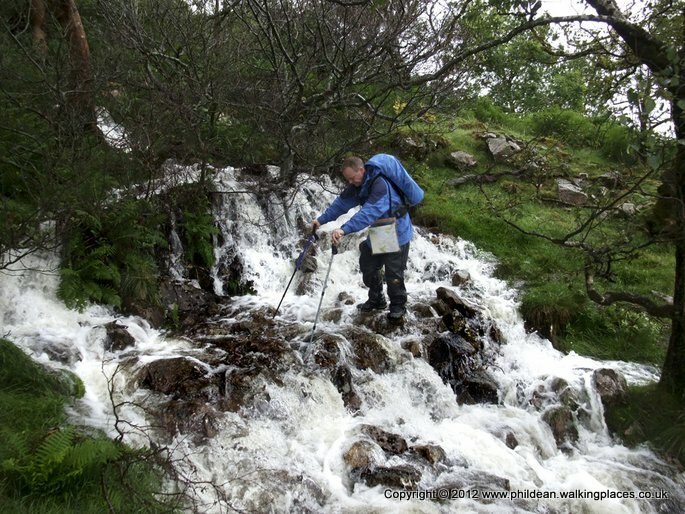 Water was pouring down the steep sides of Crag Fell onto the path making it impossible to keep our feet from being constantly submerged and it was only the rushing sound of the water that hid the squelching noises coming from Niges boots. We ploughed on and overtook an elderly American couple who stepped out of the stream to let us past. 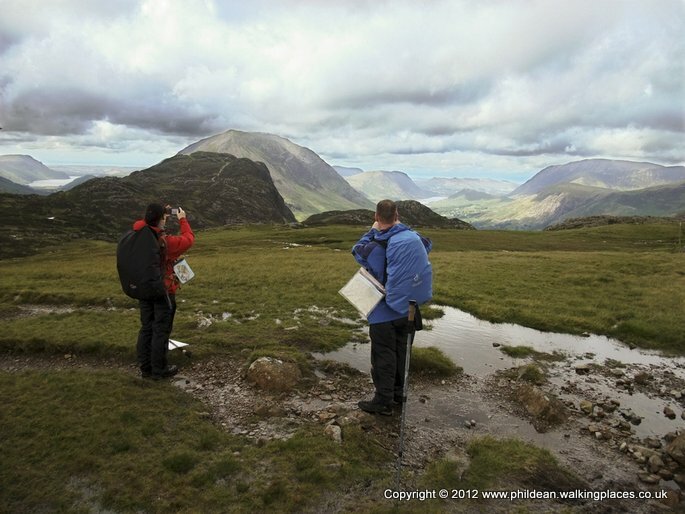 They didn’t seem particularly well prepared for this extreme weather in trainers and pac-a-macs but there was not much we could do except pass a few pleasantries and wade onwards to the next feature – Robin Hoods Chair. 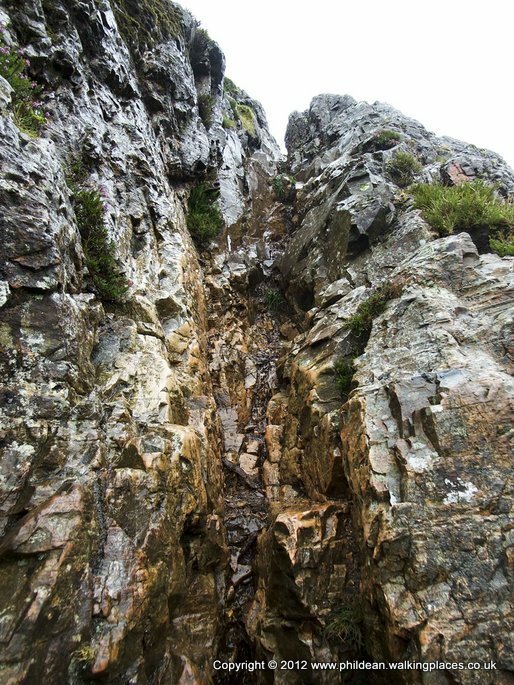 Out of the two of us, I would say that I was the one who had an issue with ‘heights’ but surprisingly I didn’t have any problem dropping down this steep and slippery gash in the rock. Nige on the other hand did not enjoy the experience at all muttering repeatedly that if he slipped he’d be in the lake. Well he didn’t slip but this manoeuvre only went to emphasise how easy injury could happen in terrain like this. We were also aware that our average speed had dropped right down and carrying on like this would mean a late finish to the day. In some places the path was impassable and we had to climb up through trees and ferns to cross cascading waterfalls. After what seemed like an eternity we made it to the end of the lake into a broad clearing where Nige stopped to put on a compeed plaster where his wet socks had rubbed his heel and started a blister. Understandably he was disappointed and annoyed that his new boots had let him down so early in the walk but we convinced ourselves that the worst was behind us and we had all the good bits and views to look forward to. 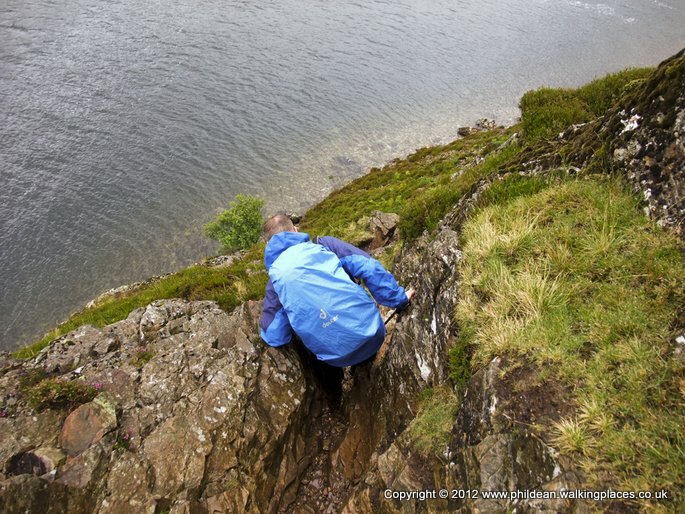 We already knew by the surrounding low cloud and rain that we wouldn’t be able to walk the higher route taking in Red Pike, High Crag and Haystacks and this was disappointing as it was to be one of the highlights of the Lake District section. 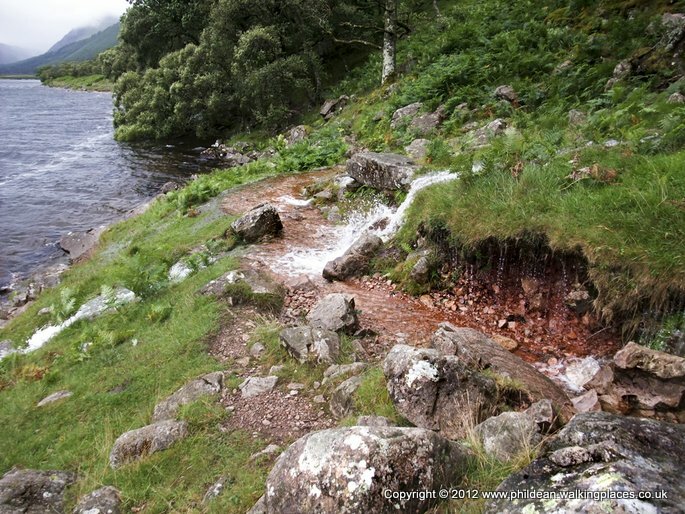 In all honesty, stood at the head of the lake watching Nige squeeze water from his socks I felt some relief we would, instead, be walking the less testing route following the river Liza through the forest to Black Sail YHA. This path seemed to go on forever and for the first time I began to suffer from not eating when my body was telling me I needed food. We had decided to wait until we got to the Hostel to have our packed lunch but the hostel never seemed to get any closer. I stopped talking or responding to any of Niges conversation and my legs suddenly felt like lead weights. I couldn’t understand why it all suddenly seemed so difficult to put one foot in front of the other and stay in a straight line. I stood on every large stone or rock where previously I hadn’t so it was with great relief when Black Sail came into view. It took an age from seeing it to entering its front door and never have I felt more relieved to take off my pack and plonk myself down on a wooden bench. I had read lots about this place and had really looked forward to my stop here but all that went out of the window as I ripped open the packed lunch bag to reveal a little bit of heaven. The reason we had had to wait for 20 minutes at the Shepherds Arms that morning was because we had both ordered the Cornish pasty. Not only was it huge and full of real meat and vegetables but it was still hot. Yes, more than 5 hours after stuffing it in my rucksack that morning the special ‘heat containing’ bag had really done its job. I ate like a Neanderthal spilling pastry, meat and veg onto the clean tables of the hostel and took my last bite just as Nige took his out of the bag. He took great delight in eating it slowly throwing in ‘ooohs’ and ‘ahhhs’ for good effect. I didn’t rise to this but instead took time to have a look around the hostel. It was pretty basic but had something magic about it. I could imagine after a tough days walking (like ours) nothing better than sitting in this room with fellow walkers eating a meal prepared by the Warden. We had the place to ourselves but there was a landrover parked at the side so the Warden must have been close by. Just as we finished our packed lunch we were joined by a lone walker, Katie who had also had a pretty torrid time navigating the southern path. She asked if she could walk with us for the next section as she was unsure of this part of the route. I was hoping that she hadn’t spotted the gps dangling from my bag and assumed that we must be competent. This is the section the book describes as ‘a little tricky in bad weather’ so it was either the fact that I had rain pouring into my eyes or the gps had been misprogrammed (again) that led to us wandering back and forth outside the hostel trying to find the start of the path that would lead us up the very steep Loft Beck. We crossed what should have been a stream, but was a raging river, very carefully but even so Katie very nearly went in and it was only by Nige holding out his walking pole for her to grab that a serious situation was avoided. Two days later I was to view a video clip from a TV news programme showing 4 girls (in UG boots) being rescued by the mountain rescue people from that exact spot! 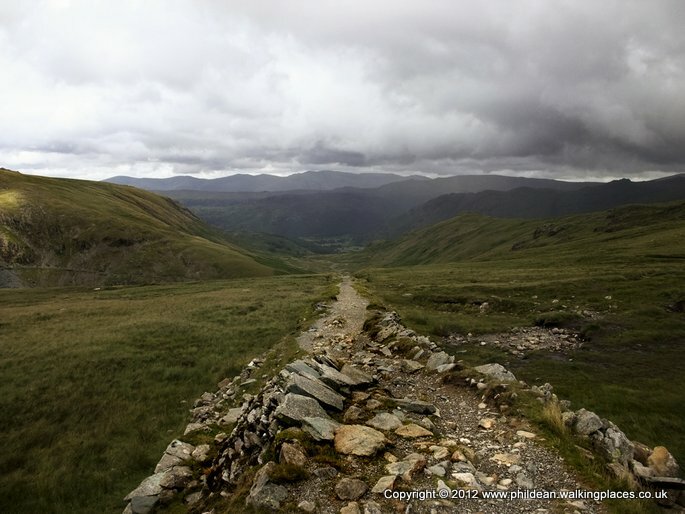 The climb up the side of Loft Beck was tough but not as bad as I’d expected and before long we were at the top and enjoying the one clear view we had during the Lake District section. 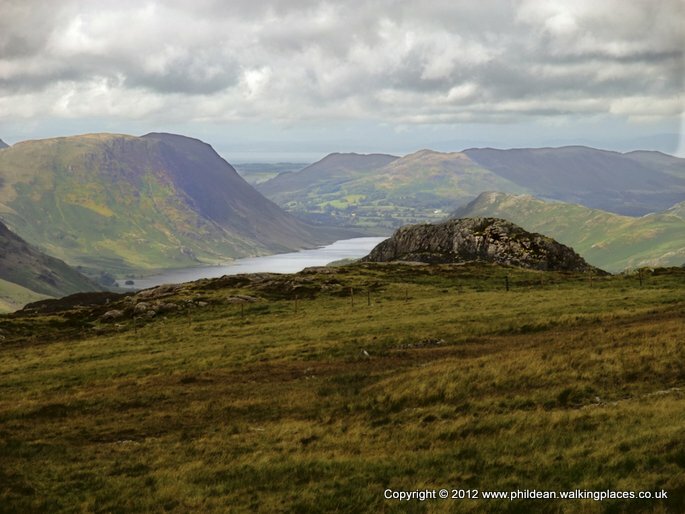 The view over to Buttermere was breathtaking but what really caught my eye was the fact that I could still see Ennerdale water and beyond that, the flat lands that led to the coast. This sobering reality that we could effectively see the starting point highlighted the long distance yet to walk and with that in mind we took a few snaps and video and followed the many cairns down to the Drum House at Fleetwith. This was the junction with the old quarry tramway that used to carry the slate down to Honister Hause and we knew this because our gps and maps told us so. However, Katie disagreed pointing across to a road running along the length of Hopper Quarry. Being so well mannered we weren’t sure what the form was in this awkward situation so as tactfully as possible we pointed out where some tramtrack sleepers still lay and set off following them down to Honister Slate mine. We stopped here and it was coffee and cake all ‘round in the visitor centre café but we didn’t hang about for long as we all really just wanted to get to our digs which we knew weren’t that far away. We followed the road and parallel path down through Little Gatesgarthdale into Seatoller where we got directions to Katies b&b, The Vicarage in seatoller. We said our goodbyes as she walked up the gravel driveway and both wished we were also so close to a shower and bed. Katie had told us that she had decided pretty much on the spur of the moment to walk the Coast to Coast and I admired her for being brave enough to attempt the challenge on her own. 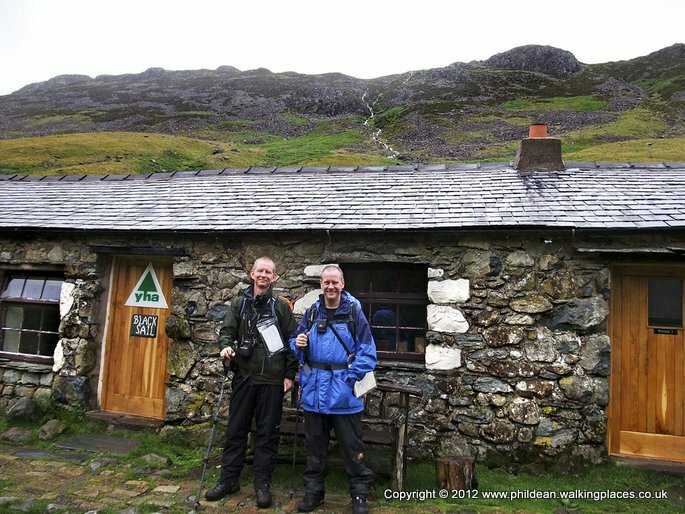 We followed the road for about another mile until we arrived, wet and tired at Stonethwaite Farm. We must have been the last guests of the night to arrive as there was a long line of boots, all full of newspaper, strung along the farms hallway. It was a traditional working farm and this was one of the few place where Nige and I would have to share a bathroom with other people but it wasn’t a problem at all and before we knew it we’d put all the electricals on charge, showered and changed into something smelling half decent, and found our way the short distance to the Langstrath Inn. We had booked a few days previous and what a good job we did. The place was heaving but we managed to secure the best table, right next to the bar, so close in fact that we didn’t even have to get up to buy the beers. We just reached across each time until we had poured 4 pints and a whisky on top of a beautiful piece of Lamb with all the trimmings. As good as it was, I couldn’t get the smell and sight of Cornish pasty out of my head! After the meal we wandered back to the bridge over Stonethwaite Beck which was the start of the next days walk which gave Nige the chance to have a well-deserved cigar. 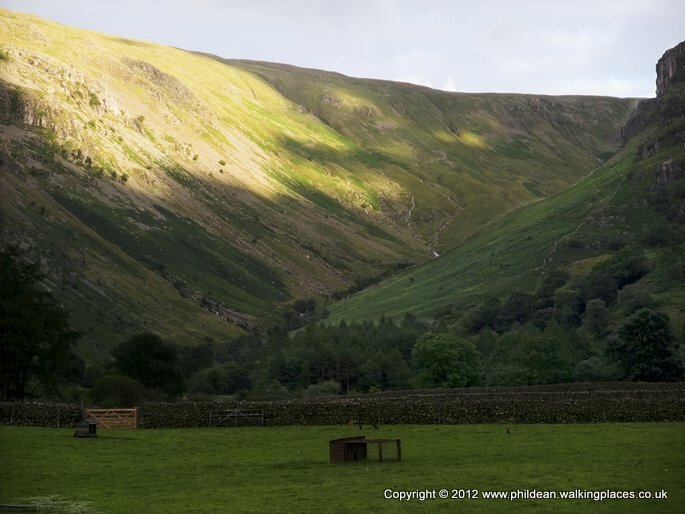 Standing on the bridge looking out across the valley floor to Eagle Crag and Greenup Gill I had one of those rare moments of peace and tranquillity where I suddenly felt a very small part of a very large picture. We stood for quite a time watching the bats swooping over and around the beck, then wandered back to the farm for another sleepless night. I thought I was prepared with all the practice on my sunny days out in the rolling hills of the peak district but nothing could prepare me for yesterdays walk down the side of ennerdale water. Approaching the lake we had to climb over trees that had blown down in the night - then walk by the banks of the lake which had actually spilt onto the path. Without exaggeration we had to walk for over 2 hours with the water constantly over the top of our boots (luckily mine turned out to be waterproof but niges didn't and he hasn't stopped moaning about it ever since). 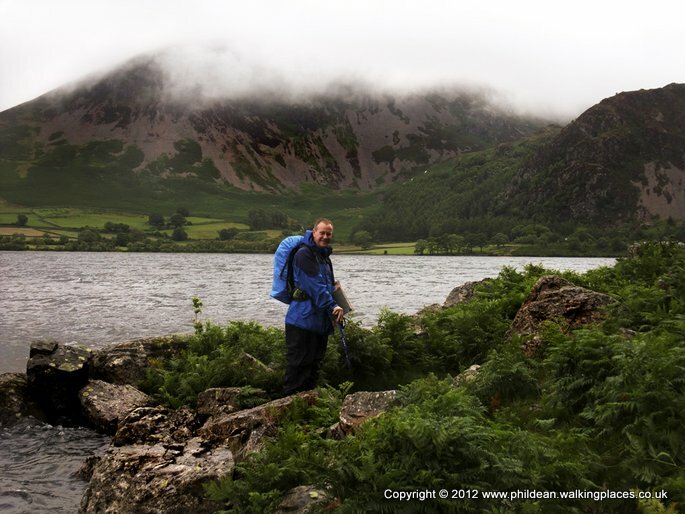 Unfortunately the cloud was so low we couldn't choose the more dramatic route over Haystacks (no point as we wouldn't have seen anythng) but went up the supposedly easier route which again involved lots of water from both sky and ground- really tough going. A girl walker on her own tagged along thinking that we knew what we were doing just because we had the gps but she soon found out to the contrary - don't think we'll see her again.